To say that the Prolight + Sound trade show was busy would be a gross understatement. 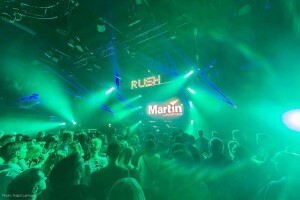 Martin celebrated theworld premiere of no less than six new MAC Viper Family moving heads, as well as a completely new range of RUSH effect lights and the response was nothing short of fantastic. "To have more tools to work with from the same tool set is a massive advantage," stated lighting designer and show visitor Paul Collison, who got an up close look at the newest Viper fixtures. "The Vipers are clearly a replacement workhorse and a family of fixtures that will be around for a long time." Martin product manager Peter Skytte was clearly satisfied with the response from visitors. "There was great interest from the opening bell," he said. It was a packed house Thursday evening at Martin’s Prolight + Sound party at Gibson Club where lighting industry professional’s partied late into the evening beneath a rig of Martin’s new RUSH range of effect lights. Gibson is Frankfurt’s hottest live music venue and it lived up to its reputation as an innovative nightclub with the new RUSH effects energizing an enthusiastic crowd throughout the night. A special RUSH light show got the crowd warmed up before the live music got underway. The party lasted well into the night and by all accounts was a big success. Also on Thursday, Martin presented Brad Helzer, winner of Martin’s second annual Young Lighting Designer Contest, with the first place prize at a special ceremony held at the Martin stand. "It’s not every day you get the chance to travel to Europe and I thank the Martin family for making it possible. It was fun to participate in the lighting designer contest and was a great learning experience. I feel very blessed and fortunate to have won," said Brad, who travelled all the way from his hometown of Colorado Springs, USA, to accept the M2PC lighting controller prize and spend a few days with Martin personnel. Martin gave away product prizes like never before with two other contests drawing a lot of participants. Visitors to Martin’s stand had the chance to win their very own MAC 101 moving head or M2GO lighting controller in a special prize draw each day of the show and Martin also gave away two RUSH moving heads to a lucky visitor each day. Although the new MAC Viper Family luminaires and new RUSH range of effect lights drew large crowds, other important product launches shared the spotlight. Interest in Martin’s new flagship lighting console, the M6, was great with demos being held from the starting gun until the closing bell. Freelance lighting technician Frans Jansen of the Netherlands was just one of many visitors who had a close look at the new console. "I was quite impressed with it," he stated. "It is really something new. It is not only very easy to use, it has the best touchscreens I’ve ever seen on a lighting console." Other product launches included the final luminaires in the MAC III series, new products in Martin’s creative VC video series, new products from Martin smoke and much more.